Private eye Kate Kinsella’s penchant for underdogs involves her in an unusual and dangerous case. Severely depressed after the death of her boyfriend (Deadly Web, 2005), Kate Kinsella is sent off to a quiet rural retreat in Wales by her protective best friend and landlord Hubert. At first, Peace Haven seems to be a New Age retreat where counselors work with troubled people, but Kate soon discovers it’s a safe house the police run for people in danger. She becomes friendly with Fran, a lawyer recently released from prison for murdering her baby son Ben. A shocked and distraught Fran confessed, although she had no recollection of the event and had been viciously attacked in the press as an unfeeling career woman whose loving husband stayed home and cared for the children with a nanny’s help. Malcolm Talgarth, a lawyer at Fran’s firm, has stood by her and rented a small country cottage where Fran will be safe while Kate reopens the case. Kate travels the countryside, interviewing the lesbian nanny, the cheating husband and Fran’s childless and bitter sister, who had a drug problem. She even tries to talk with Fiona, Fran’s daughter, whose father sent her off to boarding school. Stubbornly refusing to believe in Fran’s guilt, Kate almost dies in her attempt to prove her innocence. 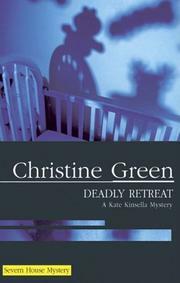 Ever-resolute Kate solves her own problems along with a child’s seemingly inexplicable murder.